UPDATED (Jan 7th): Female Body has been identified by Police and cause of death has been ruled a homicide. Click HERE for Updated Story. EGG HARBOR TWP. – The Atlantic County Prosecutor’s Office and the Egg Harbor Township Police Department are investigating the discovery of human remains found by a hunter in a wooded area, Acting Atlantic County Prosecutor Jim McClain announced. On Sunday, Jan. 5, at approximately 1:30 p.m., a hunter came across human remains in the woods behind the Shore Mall site near Broadway Avenue in Egg Harbor Township. The hunter, who is a local police officer, immediately contacted authorities and reported the discovery. The remains were collected by the State Medical Examiner’s Office, who is currently completing an autopsy. Due to the advanced stage of decomposition of the remains, a State Medical Anthropologist is also being consulted. While the autopsy remains ongoing, the victim’s remains have been identified as female. The age and race of the victim have not yet been determined. Several tattoos on the victim were also identified. 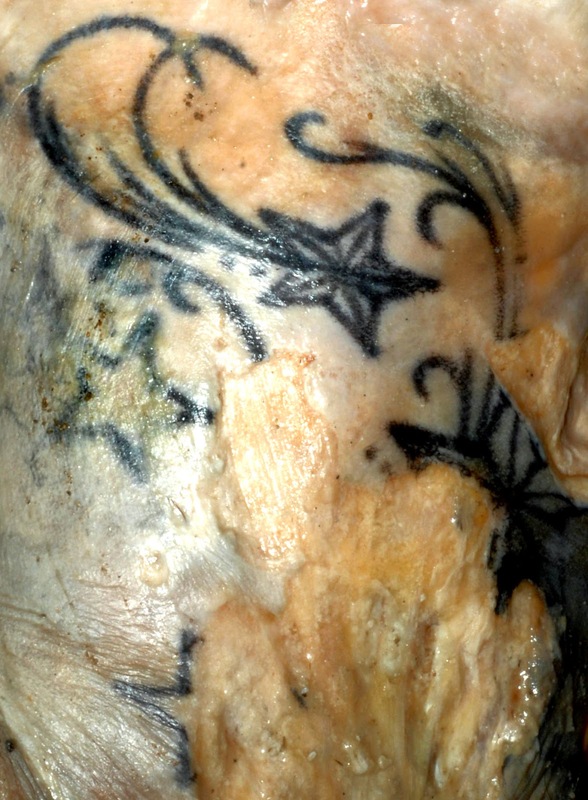 Photos of the tattoos have been released to aid in the positive identification of the victim. The discovery of the remains is currently being investigated as a homicide by the Atlantic County Prosecutor’s Office Major Crimes Unit in conjunction with the Egg Harbor Township Police Department. Additional information will be released when appropriate. Anyone who has any information pertaining to this case or has noticed any suspicious activity in the area is asked to call the Major Crimes Unit at 609-909-7666. Should ask some tattoo artist, wouldn't hurt.